Long have we known about the health benefits of ingesting vitamin C, It’s our go- to defense in the dreaded flu season. It’s boosts our immune system, fights off the sniffles and increases our energy levels. So, what can it do for our skin? In short, Vitamin C is essential for our skins’ health and function. It aids in cellular protection against free radical damage, it’s a natural skin lightener, helping in the battle against pigmentation, and is essential for the production of our body’s collagen and elastin. Spots, wrinkles, sensitivity and pigmentation are the skin concern, I’m most asked about. Although there are specific ingredients that target these problems individually, they all occur because of imbalance or malfunction in our skin. Often, this imbalance or malfunction is a result of DNA damage of our skin cells, caused by free radical damage, such as sun and pollution exposure. Vitamin C is the master ingredient, and boosts the efficacy of other ingredients so helping to tackle these concerns, and promote complete skin health. Reduction of lines and wrinkles. Collagen and Elastin are two proteins made by the fibroblast cell in our dermis. The presence of vitamin c is essential for the correct function of the fibroblast cell and can boost the amount of wrinkle plumping proteins, in your skin for a firmer, smoother appearance. Stronger skin for a healthy glow. Vitamin c is a powerful anti-oxidant that fights free radical damage. Free radical damage weakens our skin cells and causes oxidive stress leaving our skin dull and weak. Anti-oxidants rebuild the skin cells for a firmer, healthy skin and dewy glow. Vitamin c aids rebuilding and repairing of damaged skin cells, resulting in a reduction of flushing, which can occur due to sensitivity. Because it also strengthens capillary walls, flushing is less likely to lead to broken capillaries and a ruddy complexion. Because vitamin C is an anti-oxidant, it helps to correct hyper-pigmentation, which occurs due to sun exposure. It is also a cellular protector and so aids in the prevention of photo damage happening in the future. It’s natural lightening properties lead to a clearer, illuminated complexion. As Vitamin C boosts cellular function in the skin, it can aid the repairing of lesions in the skin such as spots, damage and sunburn. Because of its role in the production of plumping protein collagen, it can also help the appearance of acne scaring. Vitamin C increases the production of hydration and lipids in your skin. This will help any dry/dehydrated skin and improve the tone and texture. All of these effects on the skin are the reason IMAGE’s Hydrating Anti-Aging Serum has been the number one seller for 7 years in a row! It treats environmentally damaged and rosacea prone skin, as well as correcting dry, and dehydrated skin types, to create a youthful, healthy appearance. To ensure you are getting the maximum effect of vitamin C make sure you remove any build-up of dead skin, that can act as a sponge, (and absorb it) before it reaches the lower layers. You can correct a build of dead skin with an exfoliating cleanser such as the AGELESS total Cleanser which contains 12% glycolic acid. This is a chemical exfoliator that dissolves the glue type bonds keeping dead skin cells attached to the living healthy cells. 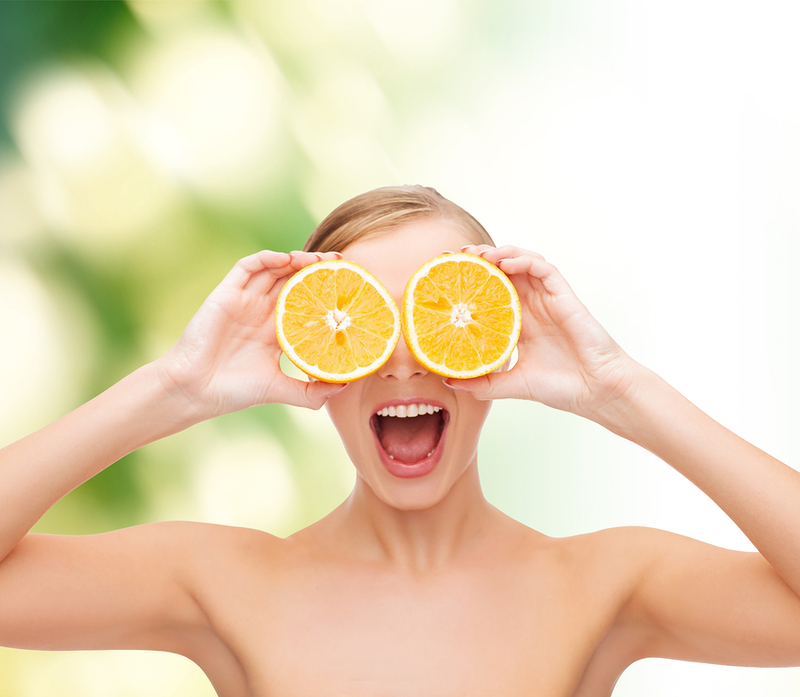 Speak to your IMAGE specialist about how to get Vitamin C into your skin care routine. Stable forms of vitamin C are found across all Vital C products from IMAGE and there’s something to suit all skin types, even oily/acne. Team this with an exfoliator from either the Clear Cell range for oily and problematic skins or the Ageless range for total resurfacing, and start reaping the benefits of Vitamin C.